Street vendor talks to her colleague while both protect themselves and the food from the pouring rain in downtown Siem Reap. Everyone is used to it. The tuk-tuk drivers sleeping on the seat just turn to the other side while the street vendors pull down a tarp that's been there for moments like these. Despite the occasional heavy rain, Cambodia is going through it's worst drought in 80 years. Animals are dying and people are losing their crops. It's a very tough time for the country. Tuk-tuk driver sleeps through the heavy rain and doesn't even bother to protect himself from the falling water. Children accompany their father on a tuk-tuk ride. These adapted motorcycles are an essential mean of transportation in Southeast Asian countries, cheaper than cars and more convenient than bikes. In Siem Reap, if it's not raining, the sun is shining bright. There is no in between. Temperatures can reach 40˚C and the humidity is very high. I easily drank 2 to 3 liters of water in one morning. On the side of the road, a group of men rest. It amazes me how in such a hot place, they wear so many clothes. I was sweating my brains out. At a park in front of the Royal Family's Siem Reap house, a group of kids plays under trees full of fruit bats. Man fishes in the river that cuts Siem Reap in half. This spot is exactly in front of the market from the previous post. Group of Cambodians chats in front of restaurants on bar street. Nightlife in Siem Reap is very lively. There is a bar street full of nightclubs, restaurants, shops and massage places. Woman bites her fists as she and other two tourists have the dead skin from their feet eaten by little fish. It tickles! 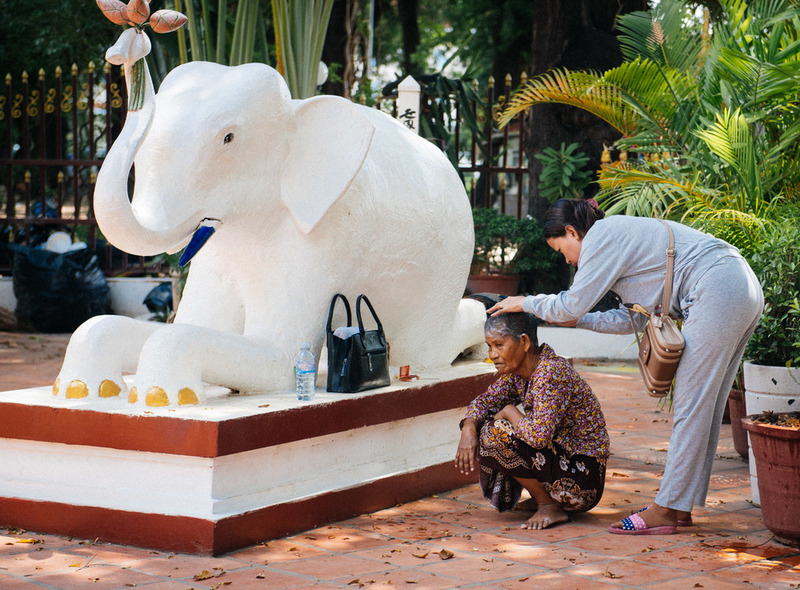 Women sit down for a meal at the monument built for the victims during the Cambodian civil war. Across the street from the children's hospital, a man rests on his motorcylce. Little girl with something in her eye clings to her backpack as she browses fruit at a market across the street from the children's hospital. Woman has her hair shaved at a buddhist temple. They believe this is a cleaning process and that all the stress and bad things in her life will go away along with her hair. Boy sleeps on the ground next to a bookstore on the bar street in downtown Siem Reap.